In North America we define each other by what we do. Therefore Bryan Patterson is by all standards quite the success. After all, he is a practicing nuclear power engineer and a published author. But that is not who Bryan Patterson really is. Ask his family and friends. Bryan Patterson is a hockey player. A professional pick up hockey player, to be exact. Patterson has played hockey all his life. He shows no signs of slowing down as he gets older, still playing three times a week. He freely admits to not being all that good at it, at least in comparison to the pros. But his passion for the game is not surpassed by any NHLer. He loves this game. There are 1000s of people like him across the world. Whether they are nuclear engineers or grocery store bag boys, they see themselves as hockey stars. They can not wait for their next trip to the local rink for their next pick up game. They do not play in a league or on set teams. They show up at the rink, draw sticks and drop the puck. 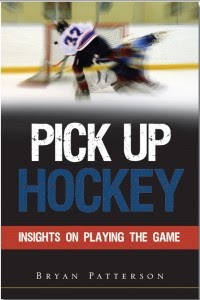 It is for those 1000s of pick up players that Patterson has written the new book Pick Up Hockey: Insights On Playing The Game, published on demand by Xulon Press. Patterson shares his memories, his experiences, and his tips for encountering every imaginable aspect of pick up hockey. The rules. The equipment. The etiquette. What to do when you have too few players, or too many, or god forbid, the goalie is a no-show. Everything is covered, even the post-game dressing room festivities. And of course "the code." A page and a half of helpful do's and don'ts, common sense reminders on how to make the game enjoyable, compiled by the author over the years. Patterson would know. After all, he is a professional pick up hockey player.